An agreement is a transaction between two or more parties about a specific something that they have agreed on. The biggest part that makes up an agreement is the statement of the terms and conditions. 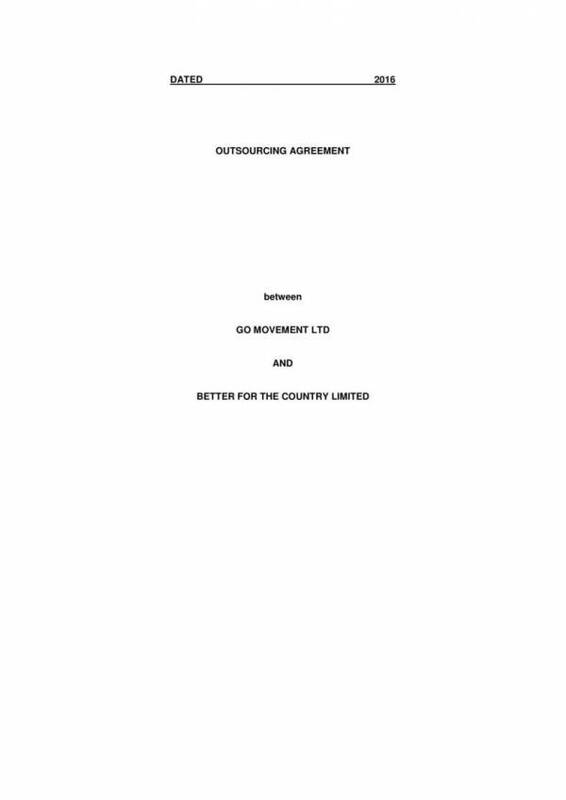 It provides details such as what all parties can and cannot do within the agreement period, and the duties and responsibilities of each party to have the agreement executed. Once bound to the agreement, there is no legal way for any party to get out of it other than to do their part. 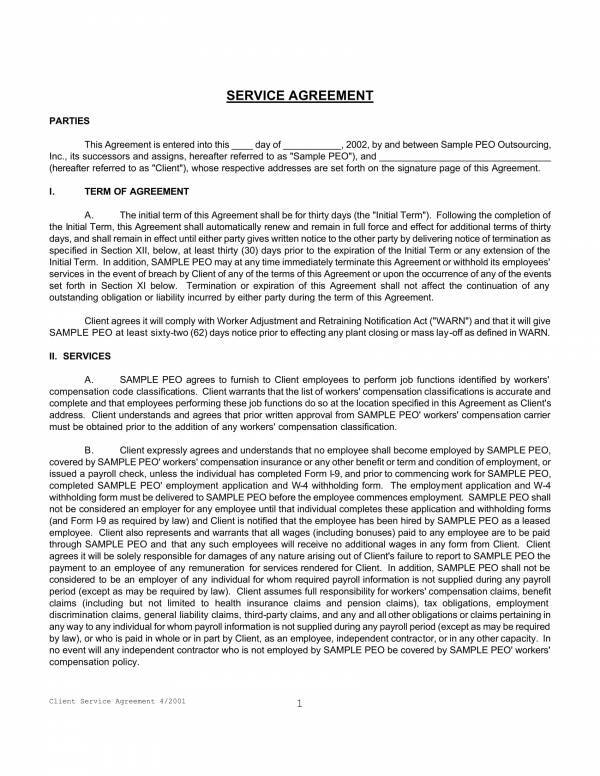 Outsourcing services agreements work this way and it is the type of agreement we will be discussing in this article. 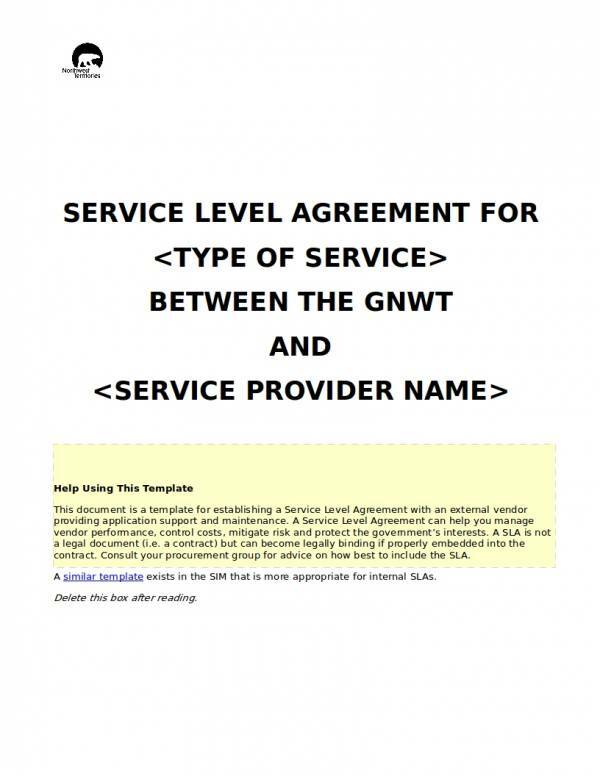 Outsourcing service agreement sample templates are also included to serve as your reference. Check them out below. Outsourcing takes place when a company hires another company to do certain tasks or have them responsible for managing existing internal company activities. This is common in almost all of the industries in operation. If companies can hire their own people and do these tasks on their own, then why do they need to outsource? There are plenty of reasons why and one of them is to cut on costs or reduce labor expenses. Hiring new people and providing them training can be costly, especially with project based jobs that ends when the project gets completed. By outsourcing people who has the skills and expertise to complete the project, the company is able to cut labor costs and at the same time get the job completed. Another reason why companies outsource is so that they can enter a new market, which will make both their business and number of customers grow. An examples is outsourcing businesses in another country passively advertises the existence of such business through the people they had outsourced. Outsourcing also has a lot of benefits to small companies or businesses to help them keep up with the non stop demand for certain services and tough business competitions. For small businesses, adding another employee to their payroll may not be logical and they may end up spending more than earning more. A small grocery store selling bread may outsource another company who makes bread and deliver it to them. This eliminates the need for them to hire their own baker and purchase baking equipment. 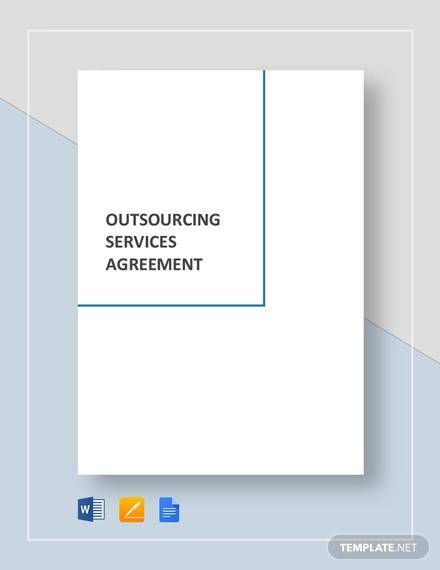 What Is an Outsourcing Services Agreement? An outsourcing services agreement is a type of business contract that takes place between a service provider and the receiver of the services. Outsourced service providers are also referred to as third party service providers and are hired to do tasks and processes that a company or organization currently does not have or when they can no longer handle doing such tasks. The document includes details about the terms and conditions of the business relationship, the fees required for the services rendered, what services are needed, the people involved in the rendering the services and many more. 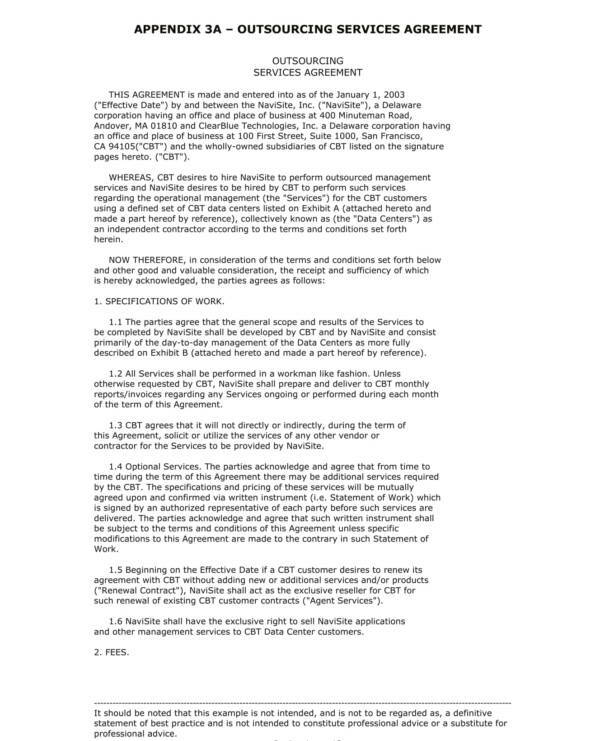 There are a number of uses of an outsourcing services agreement and they are as follows. Allows the company to perform certain company related tasks without the need to add another person or employee to the payroll. 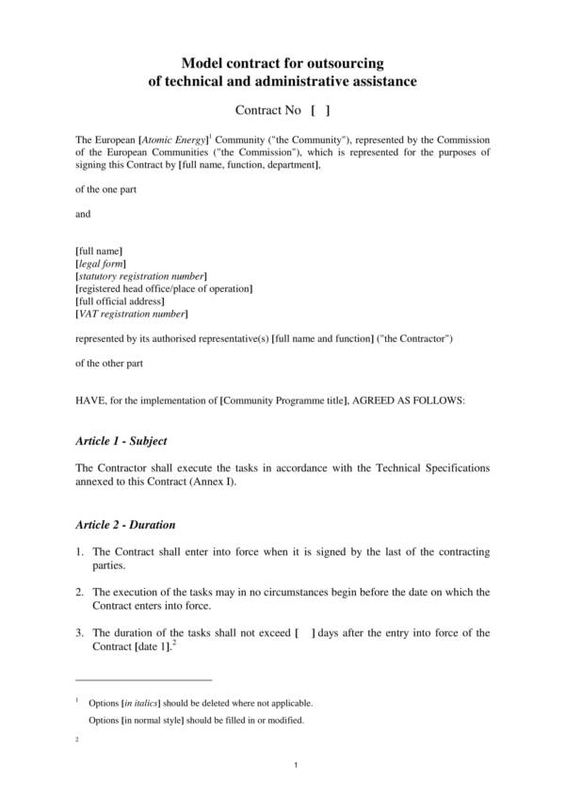 The agreement binds the service provider and the services receiver to the same terms and conditions which makes the transaction fair for both sides. It is where the agreed upon payment terms and other important details can be found and reviewed. 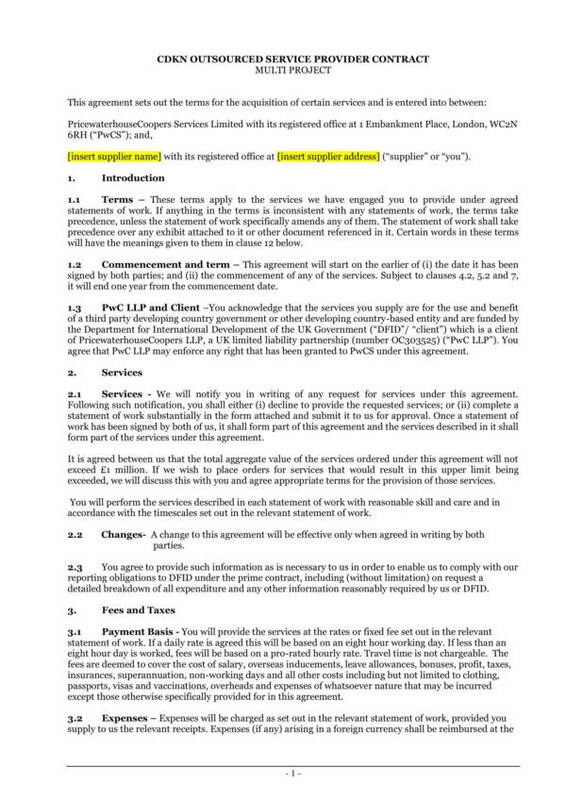 It is used a proof that the outsourcing service transaction actually took place. Companies are able to accomplish other important tasks on time with the services of experts in that field by delegating the appropriate tasks to the right people. 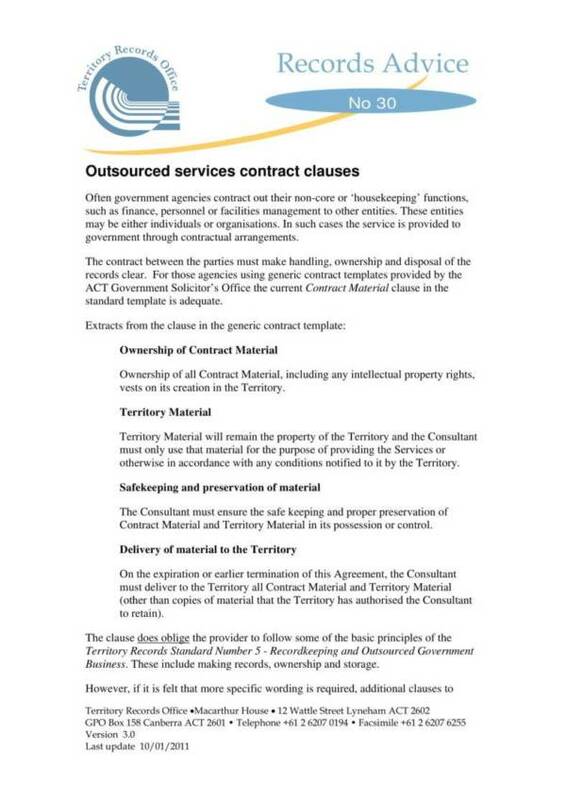 You may also want to check out topics related to outsourcing services agreement and agreements in general on our website. To name a few are Benefits of Outsourcing Payroll, Business Development Agreement Templates, and Sample Contract Service Agreements. There are many types of outsourcing services that exist and are being sued both by individuals and companies to help them with their needs on certain task. Learning about these outsourcing services allows you to get a glimpse of what outsourcing really is in different fields of work or in different industries. As its name implies, professional outsourcing offers services that can only be done by professionals and is the mpst common type of outsourcing service being used by a lot of companies and organizations. This is because of the high cost of savings that is associated with the service arrangement. Companies only need to pay for the actual services provided instead of hiring another employee. This type includes purchasing, information technology,legal services, administrative support, accounting and and other professional services. IT outsourcing is a type of professional outsourcing that is considered to be the commonly outsourced type of service due to the fact that almost every type of business today deals with technology or in need of IT services. IT outsourcing services cover all or part of the functions of information technology. This includes services, like software development, maintenance, support and so on. Another type of common outsourcing service being used today is manufacturer outsourcing. Companies who are involved in the production goods need to understand what it outsourcing is and why they need to outsource. Manufacture outsourcing is industry specific. It allows large corporations to save costs and helps small manufacturing businesses to survive the in the non-stop competitive market that exist today. Business process outsourcing, popularly known as BPO is an outsourcing service that for operational business activities. It is also one of the common outsourcing services offered. Examples of operational activities included in this type of are landscaping, maintenance of facilities, cleaning services and property management to name a few. Process-specific outsourcing refers to outsourcing of services that are specific to a certain process or specific to an internal procedure. Outsourcing is done to specific units in a company or to experts in related operations to make tasks or actvities easier for companies to handle. This also allows for a more organized and well-defined business process. Companies working on project basis jobs often need to outsource to help them manage an entire job or part of a job so that it can be completed on time. This is called project management. There are a number of reasons why companies outsource, like they do not have enough people who with the needed skills, not enough time to provide training to the employees to do the project, and the lack of funds to have it done. Often, it is more appealing for companies to outsource instead of hiring more people to train which is more costly. One of the main reasons why outsourcing is done to cut costs or reduce labor expenses and that still true with offshore outsourcing. Offshore outsourcing means outsourcing in another country. Instead of having business process done in the same country as the company requiring certain services, they outsource in other countries to be able to enter a new market and overcome some regulations in their home country. Having knowledge about the common outsourcing services being offered and used in the present will help you further understand outsourcing and be able to determine which type of outsourcing service you need. Other related topics you may find interesting are Consulting Service Agreements, Commercial Security Agreement Templates, and Sample Business Service Level Agreements. Templates are useful and very wonderful tools that an help you get things done easily and conveniently. Below is a list of the advantages of using outsourcing services agreement templates for your business. It saves time and money. The template has everything that you need in it and you no longer require the services of legal professionals and pay for professional fees to get the agreement done. The template will do that for your. That saves you time in doing the transaction and saves you a lot of money as well. It is editable and easy to use. The templates can be easily edited and are available in user friendly file formats that are familiar to us so using them will definitely be hassle-free. You don’t have to be an expert to be able to use one. You can also have it edited based on your preference or needs. It eliminates repetition of tasks. Instead of creating an outsourcing services agreement every time you need it for another transaction, you can use a ready-made template that you can edit. This will make the job easy and convenient. You also don;t have to do the same things over and over again which is just an utter waste of time. It is complete and reliable. With an agreement templates, you can guarantee that you will have a document that is complete and reliable because it will surely have in it all of the information and items that are necessary in an agreement. It can easily be searched and downloaded online. Finding the template that you need is also very easy thanks to the internet and to technological advancement. Different types of agreement templates for different purposes are now available online and another wonderful thing about it is that most templates are offered for free. The templates are neat and professionally made. When you open the file and check out the template, you can immediately see the format and layout of the template. It will be easy for you to tell how neat and professionally made the templates are. They are available in printable versions. 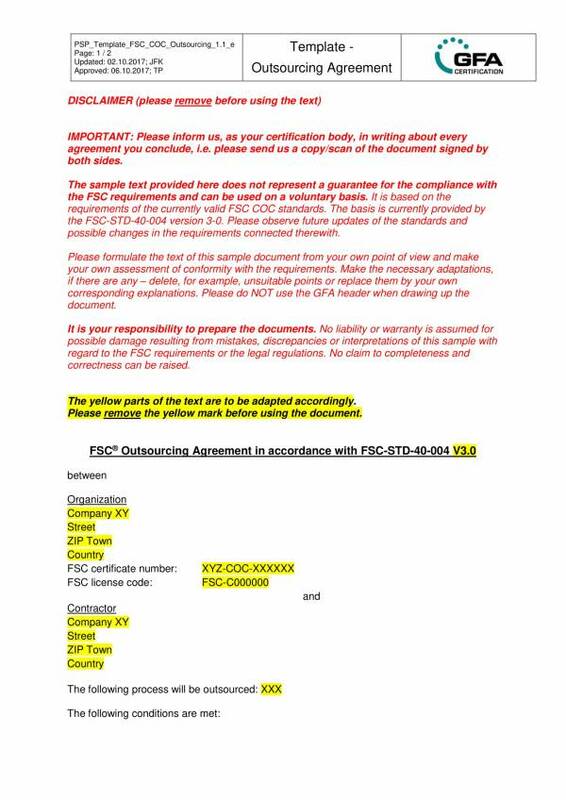 Agreement templates are now available in printable versions and almost all types of file formats can be printed, too. This once again makes the task easier and more convenient for everyone’s use. 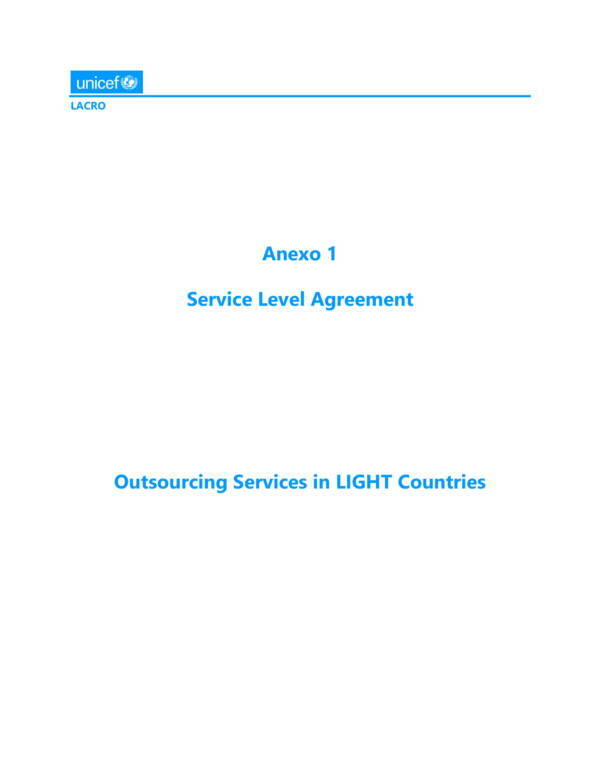 We hope that you learned about outsourcing and outsourcing services agreement in this article. We have related samples and templates available on our website that you can browse through and download. The titles we offer are Sample Master Service Agreements, Employment Termination Agreement Templates, and Business Service Agreements.